Are vaccines safe? Why does my child have to get so many? What’s in vaccines? How do they work? What’s herd immunity? Why does my child need to get vaccinated against a disease that I’ve never heard of? Parents have a lot of questions about childhood vaccination and want to get the facts straight so they can make the right decision for their families. There’s a lot information on the internet about childhood vaccination, but figuring out what is fact and what is opinion can be difficult. And depending on the information source, parents may be concerned that they’re being manipulated into making decisions to further a government agenda or line the pockets of pharmaceutical company executives. However, parents have valid concerns about vaccine safety (“How will vaccines affect my child’s health and development?”) and can feel pushed into vaccination their children by doctors or schools even if they’re uncertain. Little is known about how parents who have concerns about vaccine safety make decisions about whether or not to vaccinate their children. RTI International, a non-profit research organization based in North Carolina (www.rti.org), is funding and conducting a small project to fill this knowledge gap. Through this study, we’ll learn more about how parents make decisions about childhood vaccination, where they look for answers to their questions about childhood vaccination, and whose opinions they trust. By learning more about these issues, the public health community can take steps to improve the vaccine safety information that’s available. you’ve changed your opinion about childhood vaccination since the recent measles outbreak. If you’re eligible and participate, you will receive a $75 Amazon gift card at the conclusion of your interview. No government agencies or pharmaceutical companies are involved in this project. No one outside of the RTI project team will know you participated in this study. We won’t try to change your mind about your childhood vaccination practices. 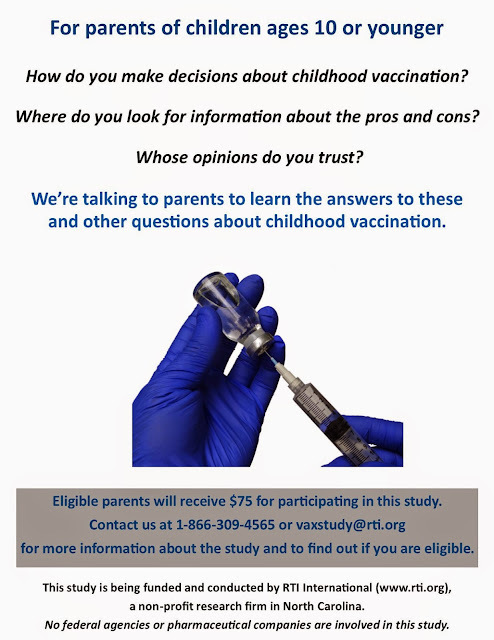 If you want to learn more about the study, please contact us at 1-866-309-4565 or at vaxstudy@rti.org. We will ask you a few questions to find out if you are eligible and you can ask any questions you have about the study at that time. This is very interesting to me and I think I may look into it. Not for the gift card on this one. This is a very debated and heated topic and I am still very conflicted about a lot of different issues with vaccines. It is so hard to know if the research and things you see on either side of the debate are indeed facts or someones opinion. I personally choose to vaccinate my kids because most of the diseases out there could be deadly. The only vaccine that I have declined is the Gardasil. It caused seizures for both my younger sisters and until they have more data to convince me, I'll pass. I don't want my kids to end up with seizures. I go back and forth on vaccines for my child. My child is vaccinated for everything but she did have lots of reactions that landed her in the hospital. I did delay her vaccines and that helped her reactions. I don't like everything they put in them and wish they would redo some vaccines. For me, not vaccinating my kids was never an option. I know it's a touchy subject, but I think better safe than sorry. Big decision for moms of babies and young children! In our case, we followed the advice of our trusted pediatrician, and not social media or blogs. It is an important topic to be sure! I hope all families will talk with their physician about vaccination concerns. Our family has vaccinated all our kids, but my husband is a doctor. He has, unfortunately, seen the negative impacts of not vaccinating more than once. we choose for our little one to get vaccines. I know some has concerns but in the long run, i personally believe it is better for everyone else and for our future generation. i hope all families knows about the vaccination for babies, because it is very helpful when they grew older..it is a great review, thanks for sharing.. It's great that there is more information about vaccination with these types of studies available. I vacinated my kids but passed on all the optional ones as I doubt their usefulness and are weary of certain jabs. This is really interesting, and I'd be curious to know how the results of the study come out. This sure is a controversial subject. I too would like to know the outcome of this study. I chose to vaccinate my children and I thank God there were no complications. This is a really tough question. It would be really informative to find out the results of this study. I chose to vaccinate my kids but I most certainly did research it and second guess if I really wanted to. This is a touchy subject for many parents. I think it is great that they are doing a study like this one without the involvement of the government or drug companies. I will have to share this with my sister. Thanks for sharing. Sounds like an interesting project & its going to be amazing to see what the output could be. I am sure most of the parents & families are very much aware about vaccinations for their kids. Very good project. The results will be interesting.